This is a copy of a letter published in The State newspaper, February 2, 2015. Also available online from the newspaper. Click image for print copy. Please cite as: Deflem, Mathieu. 2015. "USC Should Do More Than Just Award Degrees." Letter to the Editor. The State, February 2, 2015, p. A15. 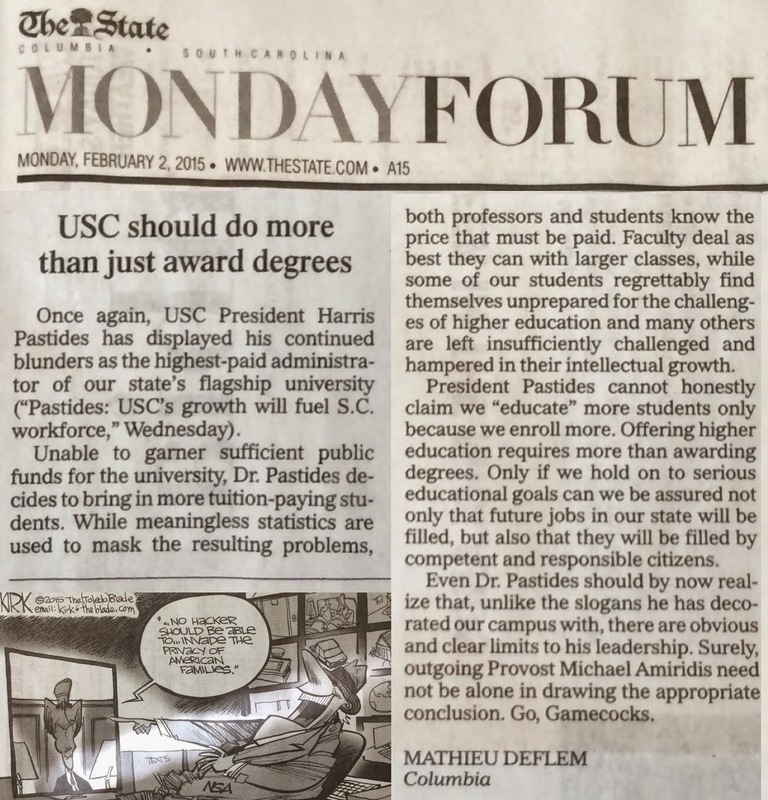 COLUMBIA, SC — Once again, USC President Harris Pastides has displayed his continued blunders as the highest-paid administrator of our state’s flagship university (“Pastides: USC’s growth will fuel S.C. workforce,” Wednesday). Unable to garner sufficient public funds for the university, Dr. Pastides decides to bring in more tuition-paying students. While meaningless statistics are used to mask the resulting problems, both professors and students know the price that must be paid. Faculty deal as best they can with larger classes. While some of our students regrettably find themselves unprepared for the challenges of higher education, many others are left insufficiently challenged and hampered in their intellectual growth. President Pastides cannot honestly claim we “educate” more students only because we enroll more. Offering higher education requires more than awarding degrees. Only if we hold on to serious educational goals can we be assured not only that future jobs in our state will be filled, but also that they will be filled by competent and responsible citizens. Even Dr. Pastides should by now realize that, unlike the slogans he has decorated our campus with, there are obvious and clear limits to his leadership. Surely, outgoing Provost Michael Amiridis need not be alone in drawing the appropriate conclusion. Go Gamecocks. See related writings on university issues.